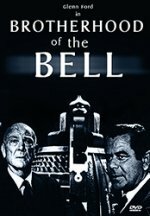 The Brotherhood of the Bell is a very good movie by any standard, and is one of the best made-for TV movies ever made. The premise is that there exists an elite fraternity whose members occupy positions of power throughout industry, academia, and virtually all levels of government. Glenn Ford plays a member of the fraternity who, in carrying out an assignment, discovers how insidious its actions can be. As a consequence, he tries to reveal it to the public. He quickly discovers just how powerful the Brotherhood is when he loses his job, his wife, and his reputation for attempting to expose it.